House and time at Malvern: No 7, 1908 - 1909. Died: 23 February 1919 aged 25 in United Kingdom. Died of pneumonia. Son of James and M.A. Fisher, Drumard, Barrow-in-Furness. B. 1894. Upper IV B - Modern III. Afterwards at Sedbergh School; in business; 4th Batt. Royal Lancaster Regt. 1913. Great War, mobilised 1914 (overseas), Captain. Died February 23, 1919. Husband of Lina Frances Fisher, of Drumard, Barrow-in-Furness. 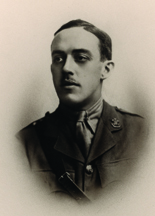 'He was still quite a small boy when he left Malvern to go Sedbergh, but extraordinarily bright and quick. He was in the Territorial Force before the war, and did good service through the five stressful years. Early this year he contracted influenza, pneumonia intervened, and he died at Waterloo, near Liverpool, on February 23rd, leaving a widow to mourn his untimely loss. He was only twenty-four.' (Malvernian, Dec 1919).